October 22, 1894 was a proud day for the prosperous German community centered around Bushwick and Ridgewood. That’s when the cornerstone of the new German Hospital, on St. Nicholas Avenue between Stockholm and Stanhope Streets, was put down. So what happened to German Hospital? 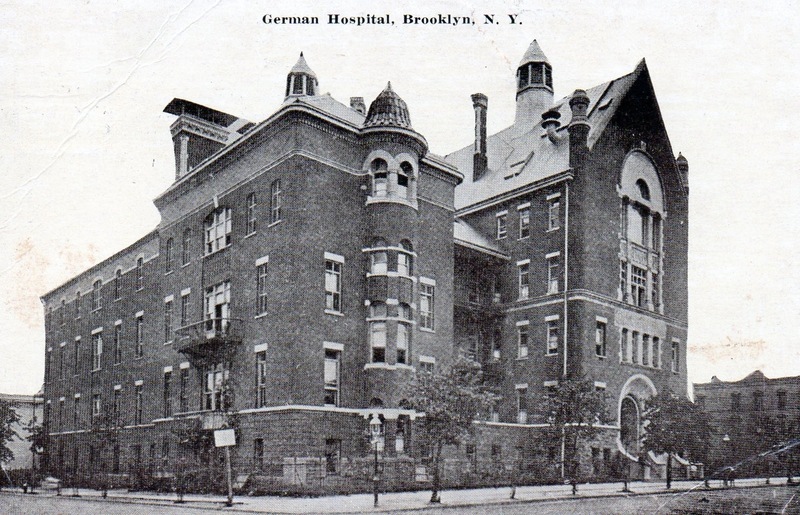 Like Manhattan’s German Hospital, it underwent a name change after World War I, when anti-German sentiment was high. The Brooklyn hospital became Wyckoff Heights Hospital, now Wyckoff Heights Medical Center. This entry was posted on March 9, 2011 at 3:59 am and is filed under Brooklyn, Politics. You can follow any responses to this entry through the RSS 2.0 feed. You can leave a response, or trackback from your own site. Or, as I’ve always called it, Wyckoff Heights Butcher Shop. I hope they’ve improved. What a great building. Where did you find the photo? It’s a postcard–New Yorkers were proud of their hospitals back then! How strange! I moved to Ridgewood, four blocks away from the hospital, in 1958. Myself, my sister, father & husband were patients there, I went to nursing school there and later worked there – but it certainly didn’t look like this photo. It was a very gothic style hospital and I can find nothing familiar in the photo. Do you know of any other photos of Wyckoff Heights Hospital? before it was torn down and replaced with the Medical Center.Thanks so much. How strange! I moved to Ridgewood, four blocks away from the hospital, in 1954. Myself, my sister, father & husband were patients there, I went to nursing school there and later worked there – but it certainly didn’t look like this photo. It was a very gothic style hospital and I can find nothing familiar in the photo. Do you know of any other photos of Wyckoff Heights Hospital? before it was torn down and replaced with the Medical Center.Thanks so much. Alia, I went to nursing school there too. I graduated in 1968. When were you there? I just remember it looking like St. Elsewhere. I was born in that hospital in 1953. I live now in Germany and met a man from east Germany Genthin, he too was born in that hospital. His mother left Germany in 1920 and married in Ridgewood a Germany man and she bore her son in Wyckoff Heights Hospital. She was proud that she bore him in a German Hospital. The picture of the original building is very impressive! Born there in 1956, lived right up the block on Stanhope St. until 61. This is how I remember it as a little boy. I was born in this hospital in 1950. I also was a candy striper and then in 1969 attended the school of nursing there. I worked pediatrics from 1970-1976.It was a beautiful hospital. I was born there in 1950. in 1966 I was a candy striper whos supervisor was Irene Anastacio. In Sept. of 1969 i started in the nursing program under Marie Odom. I graduated in Sept. 1970 and went to nwork on pediatrics until 1976. Those were some great years. my name is Patricia Nowkin (Catterson). Welcome to the Wyckoff Heights Alumni board, Patricia LOL. You graduated a year before I did yet your name isn’t familiar. I do remember Irene Anastacio, and Allen Podell was director. Do you remember Dr’s Rao, Jittanoonta, Arce, Sy, Hsu & Rathod who were all residents at the time? Yes I do. In fact Dr.Rao was a resident when I worked Pediatrics. In 1989 he took my gallbladder out now that was crazy. Also do you remember Susie Jones, Dr.Reed , Dr. Renato Yu who I went to work for after I left Wyckoff. One of my classmates was Anna Cotto and we both worked Pediatrics for 5 years. Last I heard, Dr. Rao was chief of surgery at the hospital (or medical center, as it is now) Dr. Renato Yu is a familiar name although I don’t recognize the others. I actually worked at the hospital before going to school (as switchboard operator) but did not work there after graduating. Did you know Hattie Hodges? She graduated with me and later worked in the E.R. So nice to hear from you. St. Lucia is gorgeous from what I hear. After all those years at Wyckoff Heights, you certainly saw a lot of changes. Know I wouldn’t recognize anything about it nowadays. Wish you a lovely retirement – it feels good to stop working, if you ask me! Dr. Renato Yu was a Pediatrician and was head dr. there. Also do you remember Dr. A. La Marca, Mrs Bambauer who was in Charge of Male Ward 29. There was a nurses aide named Gerstenfield and the head nurse of 5c was Gizzelle McKenzie. Patricia, aside from Dr. Yu I’m afraid no one else sounds familiar. I think there was an obstetrician named Calcagno and a G.P. named Dr. Powell, although he died in the early 70’s, I believe. I worked as a CRNA with Drs. Holder, Reed and Jones. Does anyone have any info about any of them. My grandmother worked at the hospital when she first came to New York from Germany around the turn of the century. I still have her round silver nursing pin from there. The pin states, “German Hospital” and has a red cross on it. Mary, reading your entry made me hunt down my nursing pin. It is a small round 10K gold pin with a white cross in the middle, with the words ‘Wyckoff Heights Hospital’ on top, and around the bottom is ‘Practical Nurse’, with our initials carved in the back. Have lost my RN pin but still have this one. These memories are absolutely “priceless!” I graduated WHH School of Practical Nursing in 1976 … any reunions on the horizon? How do I find out about my grandmother and her sister who trained as nurses at the (then) “German Hospital of Brooklyn” starting, we believe, in about 1901? Their names were Florence Mary Lavina Alyward b 1881 and Lazelle Alyward b 1879. Hello, My great-aunt Amalie Kaufmann emigrated from Germany around 1920, attended the nursing school and later worked at at the German Hospital of Brooklyn. She lived at 149 St.Nicholas Avenue and died in 1954.